OrexCA.com - online hotel and other tourism services reservation system over Central Asia and Transcaucasia. 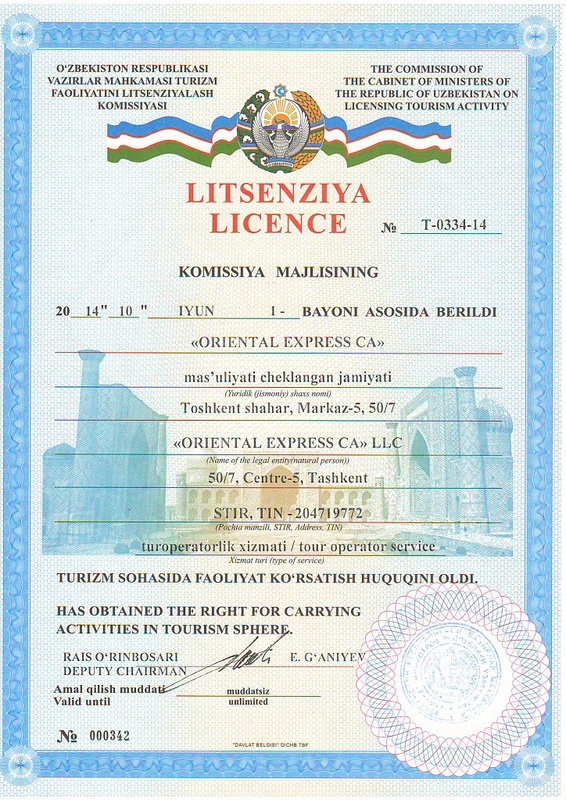 The reservation is operated by Oriental Express CA Ltd (Uzbektourism license N 037-04, Certificate N 005334). Oriental Express CA Ltd, further referred to as Service Provider, provides hotel reservation services to Client only after the Client has read through and agreed to the terms of the present Agreement. All prices for accommodation in Uzbekistan are indicated in US Dollars or Euro and are effective for individual travelers. The costs for breakfast are included (if other is not specified). The reservation is performed based on the pre-payment. The payment is performed: outside of the Republic of Uzbekistan in US Dollars, Euro, Russian Rubles or National currency (Sum). After the amount equivalent to the cost of the purchase order is transferred to the settlement account of our company based on the invoice (contract-based for the juridical entities) you are requested to provide the following data to the reservation unit: date, amount and the transfer ID number, the name of sender or company title, reservation number (provided by the reservation unit). All bank fees outside Uzbekistan are paid for by the Client. Payment by bank transfer should be performed at least two days before the check-in date. The payment may be performed in cash on the day of arrival either at the company's sales office, located in the centre of Tashkent. 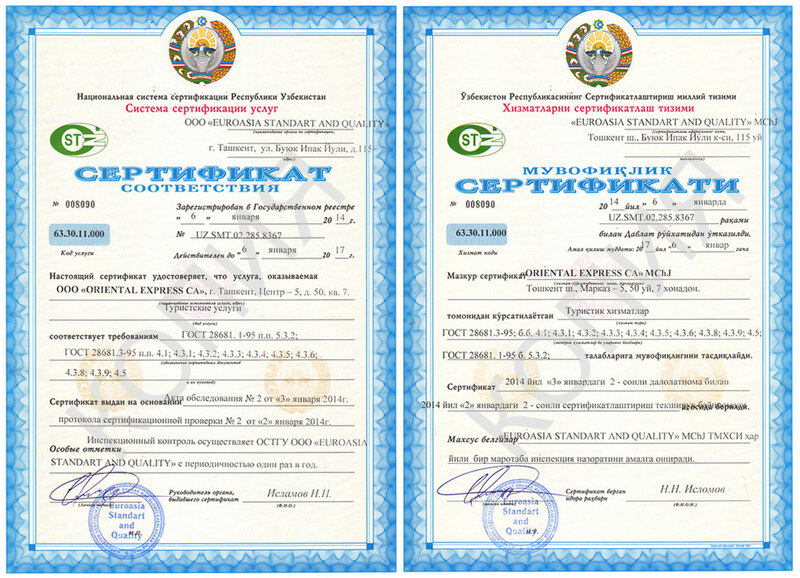 The payment is performed: within the Republic of Uzbekistan in Sums at the rate of the Central Bank of the Republic of Uzbekistan effective on the date of payment. The payment in cash should be performed at the office of OrexCA.com or at a hotel from 09:00 am to 06:00 pm. OrexCA.com sales office is closed on Sundays. You can get the details on the working hours of our sales office at the page Contacts. The Customer can pay by Visa and Master Card credit cards in company’s office. Also the payment by Visa card can be done remotely, if the Customer will send in advance an authorization form, which enables the Supplier to collect an amount equal to the cost of the ordered services. All applicable bank commissions connected with credit card transactions are covered by the Supplier. The Client shall beforehand notify the Provider of the cancellation of the Application in writing. The date of waiver of a service shall be deemed to be the date of receipt by the Provider from the Client of a written waiver of the service. In case the notification is sent on days-off or holidays, the date of waiver shall be deemed to be the first business day following the days-off or holidays. Penalty, in case the execution of services is cancelled, and periods for cancellation of application, in case penalty is not collected, shall be determined by the Provider according to the periods and in the amount of penalty (fine) specified in agreements concluded between the Provider and the Hotel(s) where the Client decided to stay under the application submitted by it. Following conditions given on web site pages with hotel description. Conditions for cancellation of the execution of services for Individual Guests: If the Client cancels the execution of service, it shall be obliged to send to the Provider a written notification on cancellation by method ensuring the receipt by the Provider of this notification at least 24 hours before the date of arrival of the Guest. The cost of purchased tickets and compensation payments for their purchase shall not be refunded. The Client by itself shall return the tickets to pay-offices and receive there the tickets fare. The amount to be returned will be paid to the Client within 15 calendar days from the date of waiver, except for the return due to force-majeure circumstances. If there is no written notification from the Client of the waiver of tour and/or medical treatment, moneys paid for services and/or medical treatment shall not be returned. The return of moneys shall be made at the expense of the Client. If the Client partially waiver the services, actual expenses of the Provider shall be reimbursed in part of the services that have not been provided. The cost of provided services shall not be returned in any case. The reservation system OrexCA.com is designed for the private use. Use of any material published at the web-portal is prohibited without the written permission issued by the service Provider. The Provider neither takes any responsibility nor guarantees that any information from the hotel database is up-to-date or accurate. The service Provider does not take any responsibility for the goods or services provided by the hotels integrated into the reservation system. The service Provider does not take responsibility for any inaccurate data entered by the Client when filling out the hotel booking form. The Client has to accurately enter the e-mail address as all further information is communicated to the Client by the e-mail. If any claims occur on the client's part during the service provision, the Client should refer to Oriental Express CA Ltd in a written form 3 days before the service order execution is complete. The Client has the right to decide the case with Oriental Express CA Ltd judicially in accordance with the procedures set by the legislation of the Republic of Uzbekistan.